Product Dimensions (L x W x H): 30" x 7" x 45"
The Omega 46 is one of the most beautiful yachts on the water. The spacious interior has two large double rooms, one in the front, and one in the rear. Now you can have it displayed right into your own room or office. Master craftsmen handcraft these highly detailed wood models from scratch using historical photographs, drawings and original plan. They are built to scale with high-grade wood such as: western red cedar, rosewood, and mahogany. They are 100% hand built individually using plank-on-frame construction method and are similar to the building of actual ships. Each model requires hundreds of hours to finish and must go through a demanding quality control process before leaving the workshop. 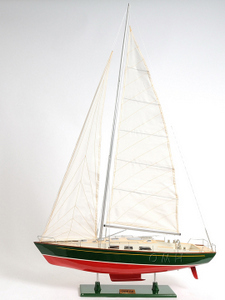 The Omega 46s hull is painted beautifully in red and green with white waterline. The mast, boom and boom vang are painted in silver. The sails are meticulously stitched that extends all the way to the masthead. The model exhibits a double deck made out of wood from the inside cabin to the gunwale. Metal stanchions hold up the guardrails in place around the deck. There are also numerous details on the deck such as hatches, winches, metal steering wheel, cabin and companion way. The model is secured tightly on a painted wood base with a brass nameplate. Itll make a perfect gift for home or office decorator, boat enthusiast, or passionate collector. This Omega 46 is one of the most beautiful yachts on the water. Classic looks combined with the most modern techniques. Designed by Ron Holland, build by Omega in Sweden. It has beautiful teak decks and cockpit, very spacious cockpit benches, superb lines and the best quality in finish and detail. Equipped options included an electric winch in the cockpit for setting the mainsail, a bow thruster for extra comfort in the harbor and an electric anchorwinch with extra controls at the helm. The magnificent and very spacious interior has 2 large double rooms, one in the bow, and one in the stern. The enormous galley has a fridge and a freezer. The salon is very comfortable with beautiful upholstery.